Tonight is Samsung's big night! In less than an hour the company will begin the big event in New York at which it's expected to launch the Samsung Galaxy S IV. 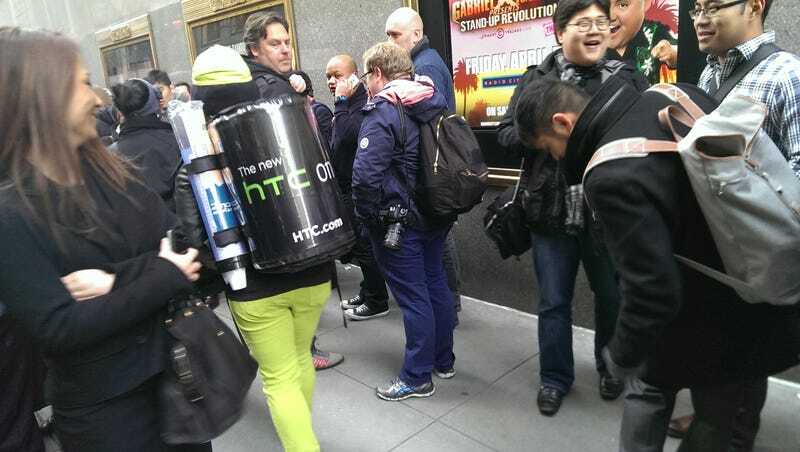 And wouldn't you know it, HTC, those trolls, are doling out hot chocolate to all the journalists freezing their butts off in the cold. Our very own Brent Rose was on hand to snap this photo outside Radio City Music Hall. It doesn't end there, either. LG has taken to Times Square—where Samsung will be broadcasting the event live—with billboards that actively troll the billboards right bellow them. Sure, this is all silly marketing, but it's pretty funny that companies are launching a war against Samsung just as it launches its most important product of the year. Tune in at 7PM for our coverage!